I thought we’d have to wait until the end of the month, but hubs’ month has started out on an upswing, which gave us the extra leeway to make the call. Actually, I’d tried to call yesterday but I called at 3:40pm Arizona time (=5:40 EST), and they closed at 5:30pm EST. Rats! Customer Service: Thanks for calling PenFed, what can I do for you today? Me: I WANT TO PAY OFF MY CAAAAAAAAAAR!!!!!!!!!!!!!! AHHHHHHHH!!!!! I think the representative got a bit of a chuckle out of my excitement. He even gave me a hearty congratulations and “Wow, good job!” after looking at my payment history. It takes 2 days to clear and then they’ll start the process of getting the title mailed out to me. He said it can take up to a month total. But that doesn’t stop the excitement from growing inside me. IT’S MINE! IT’S MINE! THE CAR IS OFFICIALLY MINE!!!!! Actually, this was our last consumer-related debt (only remaining debt is medical and student loans – see latest debt update here), so really EVERYTHING we own is officially ours! No more monthly payments for furniture loans (see here), vehicle debt, or license fees (see here). Everything we own is OURS! Not a payment owed to anyone! No one can come and take anything from us. It’s a glorious feeling, friends! So freeing! About 100 times better than I’d even expected! Hubs had to work today so he wasn’t here to witness the actual moment of pay-off. But you can bet I did a happy dance around the living room and made the girls give me repeated High Fives all around! I can’t stop smiling! It feels so, so, so good! I know we still have a long way to go (I just want to acknowledge the obvious), but for today let me just soak up the feeling. Feels so freeing! If you’d asked me two years ago, not in my wildest dreams did I think I’d be sitting here today! In fact, my original goal was just to pay off our credit cards (a measly $10,000 compared to the over $50,000 we’ve paid in the past 2 years). Seriously – the power of this community is incredible! The support and the accountability it provides! I just. I can’t. I’m so happy! Hugs and high fives all around! I feel like this is as much an accomplishment for YOU as it is for me. You’ve pushed me along and gotten me here, after all. For that, I’ll be eternally grateful! Way to go, Ashley!! You and your husband have come so far in your debt payoff journey… Congratulations on this huge milestone! CONGRATULATIONS!!!! How much better will that all paid for cruise be when you know you are consumer debt free! Next up? Build your EF so you never have to look back. Yes! That’s got to be next on the agenda! congratulations!!! what a fantastic way to start the week – and year! Wonderful news – thanks for sharing!!! Yay!!!!!!! Congrats!!!! I am SO excited for you! Last week I also did a big payment- we paid the last of our student loan! We are now debt free except our house. You are right- it feels SO good! I started reading here to help with my goal to get debt free, so I hope you are ok if I celebrate with you :). I threw a party for my husband and I with balloons and everything. I taped on my wall all of the thermometers of the past 3 years with the 6 debts we paid off. We then sat down and did the last student loan payment and then dreamed about the future. It was the best! Anyway, congratulations!!! 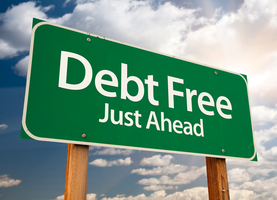 You have been rocking your debt free journey :). I love the celebration balloons! And many, many congrats on being debt free minus the mortgage! I’m so glad you’ve been reading for motivation and, clearly it’s paid off big time!!! Way to go!! Hooray!!! I’m super happy for you! I’m also so glad my February forecast was wrong! Enjoy the feeling as long as you can, relive it when you see the official zero, and then big dance when the title comes in the mail! Congrats, Ashley! I’ve always said that once a car is paid off it seems to drive a lot smoother. Take a drive and see if you agree! We haven’t had car payments in 7 years and there’s no way we’ll ever go back. Ha! It’s funny you say this because part of our car just broke! I had to laugh! Luckily, it’s a minor part (hubs looked it up and found the part online for $100 and he can replace it himself). Just funny that the second its ours something breaks on it! Congratulations! How amazing! You guys are awesome! Hooray! SO HAPPY FOR YOU! Can’t wait to see what 2016 brings for you in terms of debt payoff/EF build up. I have my money on you getting rid of Navient. 🙂 hehehe. I would LOVE to! Unfortunately, with the amount we owe I’m guessing it will be another 2 years at least. But I do hate them with a fiery passion so that’s definitely a big motivator! I know exactly how you feel as I was able to pay off my car this past Friday. YAAAAAY for a paid-for car!!! Many congrats! It’s a great feeling! That is awesome! I just recently started getting serious about my debt payoff and love reading about your accomplishments. I have paid off my last two credit card balances within the past week and now I’m on to tackling my car loan and student loans. i wanted to mention one thing that may help you out with your student loan debt as you begin to knock that out is to consider refinancing. I accumulated around $60k of debt from grad school alone, with interest rates between 6.75 to 7.8%… Yikes! I have consolidated and refinanced, bringing my interest rate down to as low as 4.5% (with a 15 year payoff plan) I have chosen a variable interest rate, so it is a bit riskier than a fixed rate especially with rates rising now, but chances are you are going to save a considerable amount of money by refinancing. I used sofi and I can’t say enough good things 🙂 with a good credit history there’s no reason to keep paying those high rates! Congrats on your recent pay-offs! I’ve considered consolidating my student loans and I may still do it, but have kind of been holding off. I actually like having them separate so I can attack one at a time (it’s a psychological thing to feel like I’m making these little “wins” along the way). But my interest rates are pretty outrageous (up to 8.25%) and I CANNOT STAND my loan servicer (Navient), so it would be nice to consolidate with another company that may be better to work with. I’m not ruling it out, just not doing it quite yet. Did you ever get Navient to properly account for your subsidized loan? Mist have missed the update. NOPE! Don’t even get me started on this! Seriously, though…I need to write a little update. CLAP CLAP CLAP CLAP!! This is a fantastic accomplishment! Congrats!! Congrats on the car payoff!